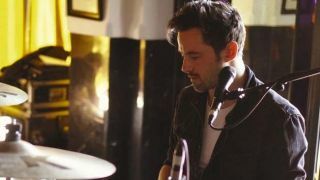 With heavyweight names such as Ed Sheeran on his CV, Brit drummer Mark Pusey has carved out quite the session niche for himself. As well as the ginger-haired chart-conqueror, Pusey has played with the likes of Tom Jones, Olly Murs and Leona Lewis. Plus, if you’ve tuned into any of the mega Saturday night talent shows over the last few years, chances are that you’d have seen Mark behind the kit at some point. As a fine example of the modern session star, who better to tackle our batch of must-know questions? What was your first kit? “It was a Premier Beverley. It was in a spare room at home that my parents set up four days before my birthday and they locked the door to the room. I went in that room so infrequently that I had no idea it was in there. Who was your first drum hero? “In those early days it was really anything I could get hold of. It was dictated by what my parents listened to. As a 12-year-old I would listen to whatever was around the house. Did you take lessons or were you self taught? “I had a teacher very early on. My parents were good enough to make sure I had decent tuition straight away. I had a teacher called Jim Ferris down in Devon. “Then I started lessons with Bob Armstrong. Then, when I was old enough to pay for the train fare, I would travel from Devon to see Bob. What is the one piece of gear you’ve got you couldn’t live without? “I’ve got the Ludwig 400 snare drum that Carlos Vega used on the Grease soundtrack and ‘Wind Beneath My Wings’. He used it with James Taylor. He toured it with Olivia Newton John. “When he died I was given that and a load of other gear. That 400 works on everything. You can put a coated Diplomat on it and it’s super-sensitive and it sounds beautiful. If you could pick anyone at all, who would you most like to take a drum lesson from? “Thanks to the internet, today it’s like you can contact and take a lesson with anyone in the world. I’d like to hang for a day with Jim Keltner. 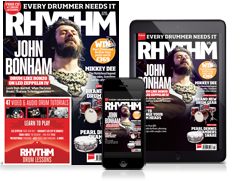 What is your biggest strength as a drummer? “Versatility. I have always wanted to work and I’ve always just been into music. It has always seemed like good sense to me to be able to play everything pretty well. “If someone calls me up asking me to do a Latin gig, if you can’t play Latin and don’t have a decent grasp of it then you’ve just lost yourself a gig and a week’s rent or whatever. What’s the key to playing a big TV gig? “Proper preparedness prevents piss-poor performance. If you’re super-prepared and know what you’re doing and you’re good, and if you’re playing those TV shows then you are probably the right person for the job. “It’s just a matter of rising to the occasion. If you’re properly prepared then the only pressure of those gigs is the pressure you put on yourself. “It’s like if you’re driving a car that can go 80mph and you’re going at 70, it’s going to be struggling and rattling around. If you’re in a car that can go 200mph and you’re going at 70, everything will be easy. “Getting a gig with Tom Jones. I loved phoning my mum and dad and telling them. “There was a song called ‘Turtle Power’ from the Teenage Mutant Ninja Turtles movie and my brother had that on a cassette. I would play along to that. “It depends on the type of music, on how hard I’m hitting, on the gig. I use mostly coated heads in the studio. But, occasionally, if I need more attack I use a thinner head that’s not coated so you get that initial stick definition.